Publisher's Note: Products purchased from Third Party sellers are not guaranteed by the publisher for quality, authenticity, or access to any online entitlements included with the product. 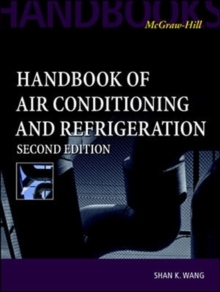 A handbook that provides practical and updated material on air conditioning and refrigeration systems, produced by an author with over 50 years experience as a practicing engineer under his beltWhether you're an HVAC or mechanical engineer, technician, or student, providing an effective controlled environment through air conditioning and refrigeration technology is now within reach. This guide provides you with all the answers on AC and refrigeration systems-from designing and selection to operation and maintenance. This book provides:*Design information*HVAC data, standards, and guidelines*A system-wide approach*Use of computers and controllers in AC and refrigeration systems*Chapters ranging from management and control systems to system selection, commissioning, and maintenance. So don't waste valuable time searching through numerous resources.